Studio 3, Inc. and long-standing client Burgerville, Inc – the Northwest’s socially responsible fast food joint – have joined forces to produce monthly, mouth-watering food photography shoots, which focus on gourmet seasonal offerings. Renowned food photographer, David Bell, was commissioned to shoot the new gourmet Burgerville look, based on his extensive high-end food photography and drink experience from shooting for such clients as Starbucks, Widmer Brothers Brewery, Publix Super Markets, Inc. and Coca Cola. The results are nothing short of delicious. Every month until December 2010, Burgerville plans to highlight one seasonal, locally available ingredient through food photography. 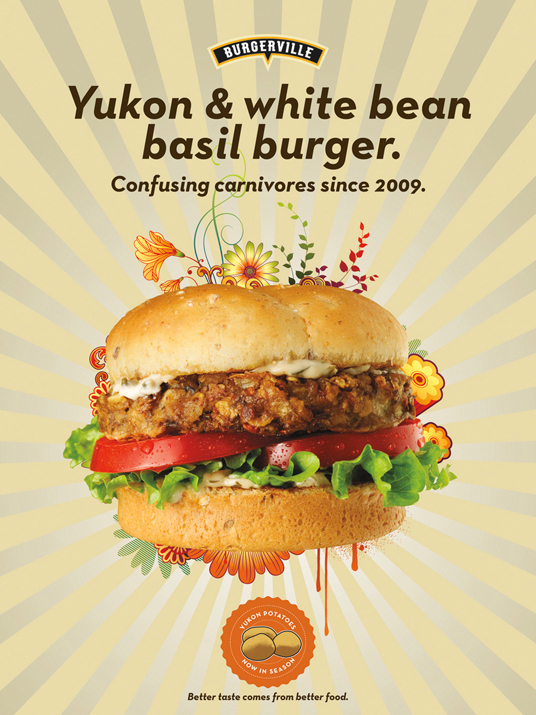 The new campaign kicked off in January 2009, with Studio 3, Inc. shooting Yukon Gold potato menu items. Rosemary, spinach, and asparagus recipes are scheduled for upcoming months. Burgerville is also considering adding regionally produced beer and wine pairings to its seasonal menus, which will perhaps add some new drink photography to their repertoire. All recipes are developed by local food chef Grace Pae and the Burgerville Chef Council. I knew I needed to make these food photography images absolutely mouthwatering. The styling and art direction was client provided, but I had a bag of tools to create an epic image that would have customer’s begging for Burgerville’s seasonal offerings. In order to create that ready to bite shot I used a wide angle lens to make sure the image was nothing short of in your face. I was lucky enough to have the capabilities to create the image and having the background white allowed me to play. The final image was later dropped on a graphic background, that only added to the highlighting of the delicious burger. To keep things real, I used strobe lighting to ensure all looked natural. 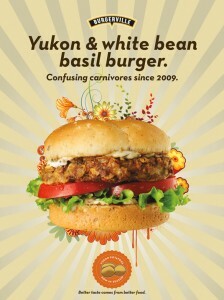 I absolutely love working with Burgerville and am definitely behind their initiative of keeping things fresh and local. I can’t wait to try and shoot their next seasonal food product. YUM! To Check Out More Food Photography Visit Our Website!